It’s tough to turn strategic intent and goals into executable project plans that are understood and owned by capable teams. We need to apply sstrategic thinking and systematic tools at the “fuzzy front end”, but many people instead use ad hoc means or turn to tactical tools and software before the objectives are fully understood. That’s like painting the house before you build it. Here is a proven method that will guide you to design and launch your most critical projects better and faster. This powerful approach comes from lessons learned over my three decades of assisting hundreds of teams worldwide, and has been proven by my Fortune 500, fast-growing smaller organization, government, and nonprofit clients. My core methodology is called the Logical Framework Approach (LFA),a highly respected Strategic Project Management system that is ideally suited to project based work of all types. You’ll like it because it is logical, flexible, scalable, and simple without being simplistic. The LFA was originally created in 1969 to help the United States Agency for International Development (USAID) plan, implement, and evaluate hundreds of complex projects in their global multi-billion-dollar foreign aid portfolio. I was recruited to teach it in 24 developing countries worldwide. I quickly recognized that these concepts would also benefit a wider audience of project teams, business executives, technologists, and professionals of all types. So I wrote Strategic Project Management Made Simple: Practical Tools for Leaders and Teams (Wiley). This post is based on that book. This classic line from the movie Field of Dreams illustrates the core Logical Framework concept missing from most approaches. Projects consist of multiple objectives at different “levels” and causal thinking (also called if-then or means-ends) lets us logically link objectives at various levels. If-then thinking offers a compact language to express our strategy as a predictive hypothesis. The logic is causal, not sequential. Project plans typically depict sequential logic (B follows A). But causal logic (B is caused by A) let us think strategically to identify the drivers that cause the higher Objective to occur. This cause-effect perspective helps build a shared understanding of the big picture among key players. The logical “if-then” linkages form a testable strategic hypothesis that promotes collaboration, communication and coordination to achieve strategic Goals. These if-then linkages form a strategic hypotheses – our mental model of how our project will produce results that ripple up the causal chain. This “project backbone” provides a foundation for success. I have crafted four critical strategic questions that are captured in the Logical Framework matrix, 4×4 interactive grid that organizes key project design information using from management and science. Answering these populates the matrix. Let’s Let’s do a deeper dive into how each question illuminates an important aspect of the project. .
What are we trying to accomplish and why? The first question illuminates project Objectives, and we recognize that every project consists of four distinct levels of objectives as previously defined. Projects are instruments of change. The project payoff and benefits occur at the Purpose and Goal level. But we cannot directly control these levels – they are “hoped for” Objectives. What we can manage/control are the Inputs and Outcomes level. So we design projects by identifying the necessary and sufficient set of Outcomes (deliverables) to achieve the Purpose or the changed conditions expected after the project. Purpose is the linchpin that connects what we can make happen (Outcomes) to strategic intent (Goal). This strategic line-of-sight helps keep our eyes on the prize. 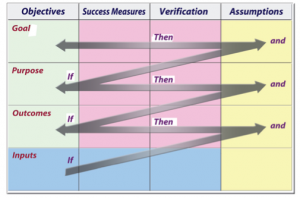 The second strategic question sharpens the definition of Objectives at each level by establishing success measures (metrics) and means to verify them. These are captured in the green middle two columns. Measures describe the expected level of accomplishment using quantity, quality, time, and cost indicators. 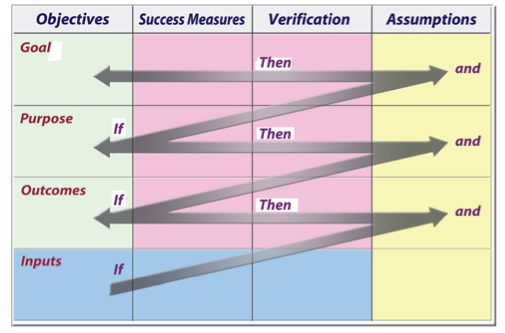 The Verification column sets up the basis for monitoring implementation (Input to Outcome) and measuring impact (Purpose and Goal). By setting separate measures at each level, we can monitor progress and evaluate achievement at each level. Risks exist in every project. The third strategic question illuminates critical Assumptions and risk factors. These can include dependencies, interfaces, policy considerations, resources, market factors, and other important conditions needed to make the if-then logic valid. Captured in the fourth column, Assumptions and are a jumping-off point for further risk analysis. Uncovering these early lets us outsmart Murphy and his infamous law. Answering the first three questions provides clarity for developing the work plan. The blue Input row captures tasks, schedule, resources, and responsibilities. Conventional project management tools (e.g., WBS, Gantt charts) flesh out the Input to Outcome linkages. The Log Frame concepts smoothly dovetails with other corporate systems and tools, fills in some missing gaps, and improves overall effectiveness of leaders and teams. It offers a sharp lens to see the big picture and a rigorous but flexible framework to plan, implement and evaluate projects and initiatives of all types. Users find that the common language and logical structure helps both cross-functional and intact teams to collaboratively design, communicate, and execute projects. Want some examples? Go here to request up to 8 different project designs and other resources. Then put this system to work and get great results! I browse through and have a sense that the methodology is systematic and logical and yet not cluttered with jargon. I think it is effective.